So we've all either heard it or said it - "Mom - I'm bored!!!" - in honor of the start of summer, Shannon over at Rocks in my Dryer has asked all WFMW participants to throw out some boredom busters. My little guy is only 20 months, so I haven't had a lot of dealings with boredom yet, but in brainstorming this past week I thought back to an activity I remember from childhood - scooping, splashing & measuring water. The concept is simple - children LOVE water - start with a dish pan, a plastic tote/storage box or aluminum tub...basically anything that will hold a decent amount of water. Fill it up with water and then add various cups, scoops, measuring cups, etc. to the mix. I set our station up on our deck (so the mess is minimal) and my little guy can play, splash & dip water to his heart's content. As I said before, our little guy is just 20 months, so for him, this is mostly just for fun...sure, learning to pour from one container to another is a learning exercise...but mostly he's just splishin' & splashin'. However, for older preschoolers, you can also really turn this into a learning activity about measuring - and FUN! Our little fella LOVES anything water, so this one definitely works for me! 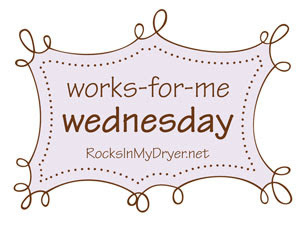 For other great boredom busters, head on over to rocks in my dryer!